Women have a passion for cultural events and enjoy having a number of different sources available at their disposal to keep up to date on cultural events, but what sources are essential to their experience? As part of the POPSUGAR Insights Content, Commerce, and Culture study, we surveyed over 1,500 women between the ages of 18-44 and asked them to share the primary reasons they tune in. Overall, the number one resource for women was Facebook (50%). Other popular social media platforms that women use to stay connected include YouTube (39%), Twitter (21%), Instagram (18%), Google+ (11%), Snapchat (9%), Tumblr (9%), and Vine (6%). Other ways that women use social media to stay connected on these topics include following the event via a specific hashtag or trending topic (21%). The second most popular source for women to stay up to date with cultural events is TV. Overall, 49% of women watch a program on TV about the specific event to stay informed. Other forms of traditional media that women use include reading a magazine or newspaper article (37%). 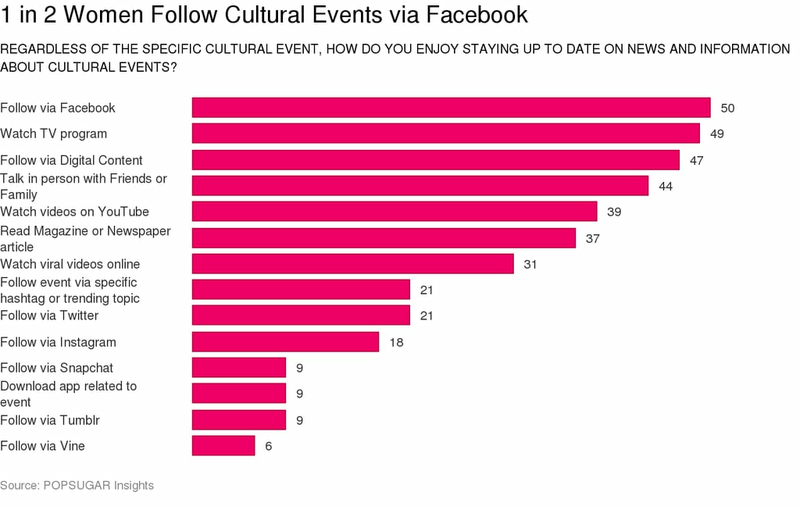 Digital content ranked third overall in terms of how women stay informed about cultural events. Overall, 47% of women read online articles about the cultural event, 31% of women watch consumer-generated videos about the event, 19% watch professionally produced videos related to the event, and 9% download an app that is dedicated to content about the specific cultural event. Finally, speaking with friends and family in person, via texts, or on the phone ranked fourth overall (44%).